The DC/Looney Tunes crossover one shots have been of really variable quality. Some of them I haven’t enjoyed much at all. 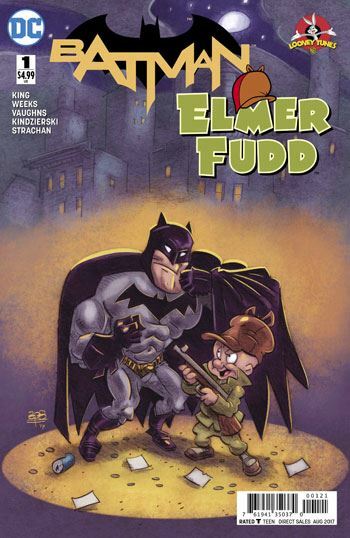 But easily the best of the lot, so far, is the Batman/Elmer Fudd issue. And frankly, I think it sets the bar so high nothing else will top it. Tom King writes both of the stories in the issue. He has been doing some really exceptional work on Batman, so I am not surprised that I really enjoy his tales here. The contrast between the two could not be greater. The first one is pure film noir, with Elmer Fudd hunting down Bruce Wayne to exact vengeance after the murder of the woman he loves, a woman who fled from Bruce. Silver St. Cloud. I am old enough to have bought the issues of Detective Comics when Steve Englehart introduced Silver and played out the tragic romance between her and Bruce. It always thrills me to see her again, but up until now I have found the stories that brought her back disappointing. Not this time. 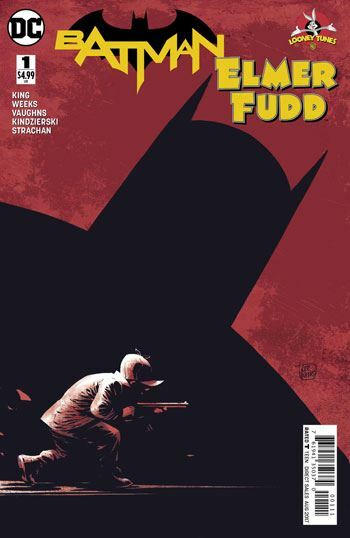 The first story is dark and gritty, and with the world weary sadness that needs to pervade any decent film noir, and which blends so well with Batman’s grim world. Then, just as one is recovering from the conclusion of that tale, King spins us into sheer hysteria with the second tale, a hilarious romp that his highly reminiscent of a Bugs Bunny cartoon, with Batman taking the place of Daffy Duck. Neither of these stories would work half as well if the art wasn’t so perfect. Byron Vaughns re-creates the Looney Tunes world as if it was drawn in the 1950s. That’s a compliment, by the way. And as for Lee Weeks, I really lack the words to praise his art as much as it deserves. Rather than stick a bunch of anthropomorphic animals into the story, Weeks evokes them while giving them human form. The Bugs Bunny character in the first tale has the head shape of the rascally rabbit, and his teeth, but is undeniably human. This is a big risk. If it didn’t work, it would have felt awful. But each of the Looney Tunes characters who show up in the first part are easily recognizable, despite not looking anything like they do in the cartoons. Such re-imagining is a hallmark of a talented artist.